Stylish remodeled condo ready for your Spring getaway. Close to beach & pools! 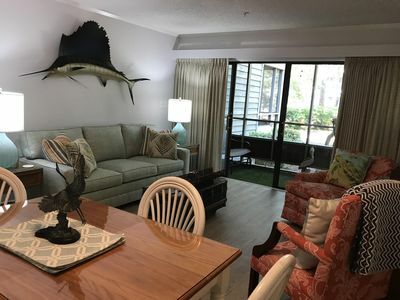 Tastefully decorated and recently renovated - Ocean Creek Plantation Lodge 2 Unit 2152 is a perfect unit to accommodate couples or small families (2 adults 2 children). It is designed with the comforts of home in mind including password protected wi-fi (wpa2) and HBO. It’s conveniently located on 1st floor on the far eastern end of the Lodge 2 - a mere 1800 feet to the ocean’s edge. Ocean Creek Plantation is a gated 57-acre oceanfront community with 24/7 security located at the northern end of Myrtle Beach, SC and the southern end of North Myrtle Beach, SC. It is conveniently located near Barefoot Landing, restaurants, 100’s of golf courses and entertainment attractions such as House of Blues, Alabama Theatre and Alligator Adventure. Tanger Outlet and Myrtle Beach Mall as well as many other shops and restaurants are within minutes of the community. Ocean Creek Plantation also hosts its own restaurant: Four Seasons located in Lodge 1. Ocean Creek Plantation features 7 pool areas including an indoor pool located in Lodge 2 and Beach Club with snack bar. Catch a ride on the tram (seasonal) or enjoy the short walk down the pedestrian walkway to quickly get to the beach. Unit 2152 in Lodge 2 East is a 1 bedroom (king bed) condo with 1 ½ bathrooms nestled in a grove of myrtle trees behind Tower South. The unit comfortably accommodates 4 persons (4 adults or 2 adults/2 children). The master bedroom features a king size bed with a small wall mounted tv. It is adjoined by a full bath. Adjacent to the full bath is a ½ bath which can be closed off from the full bath for privacy. Quality bed linens and towels (including 2 beach towels) are provided for our guests. The living area features a queen size sleeper sofa complete with pillows/linens and comfortable chairs to relax in. The dining area comfortably seats 4 with additional seating on the screened porch. The kitchen is fully equipped with everything you need to prepare anything from a quick snack to an evening meal. If you prefer to cook out, the unit is located near the outdoor grilling area – just bring your charcoal. Either way, enjoy meals inside at the dining table or on the screen porch – a slightly obscured view of the ocean can be enjoyed as well. Afterwards relax in the living area, reading a book, watching tv (50” flat screen cable tv with HBO included) or playing games. Unit 2152 is one of the few lodge units with a washer/dryer inside the unit. For large heavy loads, commercial washer/dryers are available on floor 2 at the top of the stairs. Please note this is a no smoking/no pet* lodge unit. The no smoking policy includes the screened porch. *The no pet policy is an Ocean Creek Resort policy. Owners are permitted to have pets and you will see many pets on the property. We are very sorry we cannot allow our guests to bring their loved ones. Ready to go to the beach? Grab the provided beach chairs & towels and catch a ride on the tram. The snack bar at the Beach Club offers a variety of sandwiches and snacks as well as Happy Hour drinks. We hope that your visit at Ocean Creek Plantation Lodge 2 Unit 2152 is pleasurable! Book your vacation today.